Preheat grill to medium heat for 10 to 12 minutes. Brush the ears of corn with olive oil and set aside until grill is hot. In a small bowl, add the butter and cook in the microwave until melted. Whisk in the chipotle, adobo sauce, honey, fresh lime juice and salt until well infused. Taste for salt, set aside. Grill the corn for about 20 minutes, turning as needed. Remove from heat and let cool slightly. 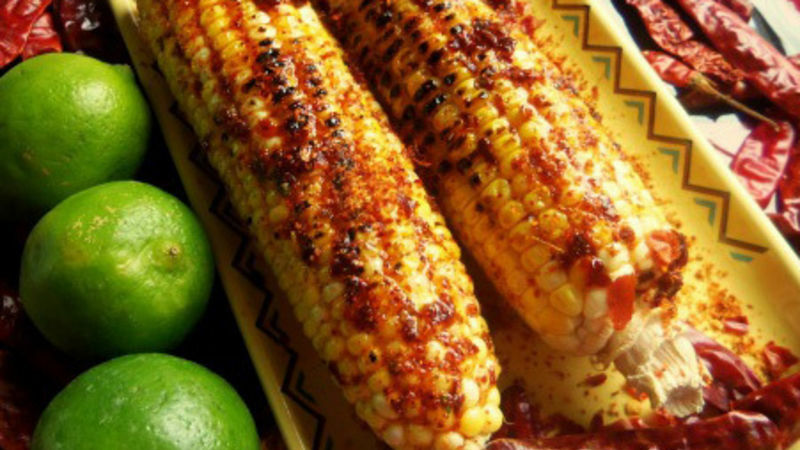 Brush the ears of corn with chipotle honey butter and sprinkle generously with chile limón powder. Serve right away. To freeze fresh corn, remove kernels from the cob and spread out evenly onto a cookie sheet lined with parchment paper. Freeze for a couple of hours, then transfer to a freezer bag. Freezing on the cookie sheet first prevents the corn from sticking together. *Chile limón powder is found in most Latin American markets. I loved corn as a child and I love it even more as an adult! I used to live in a mostly Mexican neighborhood in California and I still remember that in the late afternoons you would hear an old Mexican man wearing a cowboy hat yelling, "Elote!… Elote! ", while pushing a cart filled with steamed corn and all the favorite toppings.